You are at:Home»Herbs»Aloe Vera Var. Latin name : Aloe vera Var. Description : Aloe Vera has amazing health benefits. The herb is known for its medicinal properties and is useful in several health conditions. It helps in halting growth of cancer tumors, eases inflammation, helps in arthritis, lowers cholesterol, prevents kidney stones, soothes ulcers, lowers blood pressure in people suffering from high blood pressure, hydrates skin, provides essential minerals to the body, helps in preventing colon cancer, heals intestine, lubricates digestive tract and ends constipation. Aloe Vera is also helpful in stabilizing sugar levels in diabetics. It has been studied around the world and results show that aloe vera offers wonderful support for our immune system and helps ward off illness of all sorts. Aloe vera is a versatile plant that can be used both internally and externally, offering multiple benefits for the skin as well as for the inside of our bodies. The benefits of aloe vera have been broken down into three groups, including, anti-bacterial, anti-viral and anti-inflammatory. 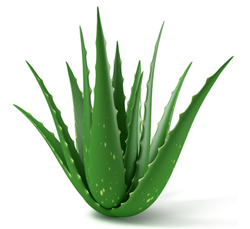 When used on the outside of the body, aloe vera can help cure many ailments dealing with the skin. Conditions of the skin that may benefit from the use of aloe vera are minor cuts, scrapes, burns, sunburns, razor burn, acne, dandruff, dry skin, eczema and psoriasis. When taken internally in the form of a juice, aloe vera can offer even more rewards. Because the aloe vera is so rich in nutrients it is able to serve many purposes. Aloe vera helps the body release pepsin, which is the gastric juice enzyme that we need to digest our food. This helps conditions such as ulcers, irritable bowel syndrome, heartburn, constipation, colitis and any other digestive tract irritations. Those with HIV or other diseases that cause the immune system to be weakened can benefit from taking high doses of aloe vera. Recommended Dosage : Juice : 10-20 ml; Dried Latex : 125 mg to 500 mg powder.